Uppingham Town and Ketton Lions will meet in the semi-finals of the Stamford Charity Cup after winning their quarter-final ties easily tonight (June 10). Uppingham, the runaway leaders of Rutland Division One, beat second division King’s Keys by 64 runs, while Ketton were 55 runs too good for Castor. Martin Bennett (64) top scored in Uppingham’s 20-over total of 149-5 before King’s Keys were dismissed for just 85. Danny Dumford took three wickets, a catch and executed a fine run-out for the winners. Ketton’s prolific Aussie Ben Bryant was predictably to the fore in their win. 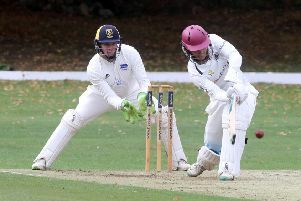 He finished unbeaten on 67 and claimed two wickets, but he was overshadowed for once with the bat by Shakaar Mahmood who contributed 83 of Ketton’s 169-6 and with the ball by Ulrich Van Duyker who returned figures of 3-17 from four overs. Uppingham will host Ketton in the semi-final next Monday (June 15, 6pm). Nassington entertain Bourne in the other semi-final on the same night. Uppingham 149-5 (M. Bennett 64). King’s Keys 85 (D. Dumford 3-21). Ketton 169-6 (S. Mahmood 83, B. Bryant 67no). Castor 114 (M. Spinks 25, U. Van Duyker 3-17, B. Bryant 2-17, J. Smith 2-30).